Home » Russian Food » Have you ever heard of Russian medovik cake? Let’s find out here! You probably have heard almost all the Russian dessert, there are numerous of them and all taste delicious. All of the sweet cakes Mouthwatering Cake That You Can Only Find In Russia is starting to go global and get their recipe share all over the world. Medovik Cake or also known as the Honey Cake is another all-time favorite of any Russian that goes back to their childhood. Hands down, this cake totally a beautiful creation right from the kitchen with time-consuming and a lot of patience. Moreover, with some super sweet and rich in taste cake also come with fascinating historical origins. Let’s find out more about this authentic Russian dessert. Medovik, as one of the Most Favorite Dessert In Russian Cuisine, has some of the sweetest story background dated back to the early 19th century in the Imperial Palace kitchen at the time when Emperor Alexander I was ruling. Empress Elizabeth, his wife does not like honey and disperse any dishes, dessert, and cuisine that has honey on it. Long story short, a new confectioner make a cake out of honey and thick sour cream. Surprisingly, the cake turns out beautifully with no trace of honey and won over the Empress love with the delicious cake. That is the starting point when this cake become a very exquisite dessert that made it to the palace dinner table and loved by the Tsars and emperor. This cake is also the Most Served Desserts In Russian Restaurants also the dinner table of any household in Russia, particularly during holidays. Honey is the main ingredient to this cake that was the primary source of sweetness before sugar. Moreover, it is also a reliable medicine for topical usage, fevers, and chills relieve. In the time where honey is easier to have than sugar, many Russian drinks and food have a little honey in it. So, no wonder when this cake become popular in Russia, it also elevates honey as a very healthy and versatile usage. Although honey already has a great wide variety of usage in Russia, the use in the cake makes honey even more popular. The recipes for honey cakes remain simple with a very long time to bake. That is why this cake is a must have item during various festivities. There is always someone in the neighborhood that has a Medovik Cake on their dinner table. Usually, it has crushed walnuts and apple slices on top and very famous around the three August harvest festivals. As honey also a natural resource that harvested around August than festivals such as the three Saviors, Medoviy Spas, or Honey Savior is the day to gather honey from its honeycombs, and hives and combs. Other festivals when the honey cake is a huge hit is during Yablochniy Spas, and also Not Made by the Hands Savior. There are three layers of Medovik cakes which consist of Korzh filling, one layer of cream and repeat the layers. 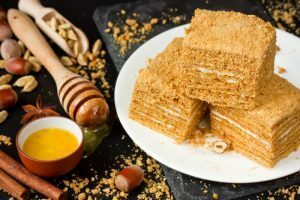 This cake takes a full abundance of honey stored away and has a resemblance to another famous Russian dessert and its Must Known Facts Of Tasty Russian Napoleon cakes with layers of thin pastries. It comes in more than 3 tier cakes full of sweet custard, condensed milk, buttermilk, and sour cream. Other Russian cake that has a similar feature of having layers cake that combines sweet and savory at one tier. The main ingredient of almost Soviet-era sweetener is the famous Condensed Milk. Some of the Legendary Uni Soviet Candies And Sweet are more than familiar with this one particular ingredient. In the old days, mother and grandma will lure their kids home with a spoonful of condensed milk carmelized over a fire. In this honey cake, it uses a boiled tin of sweetened condensed milk right with the tin, for almost three hours. It is a very long time to step up just one component of the cake. Then the milk burst out caramel flavor and produce almost pudding-like substance. There are stages and steps to perform the multi-stage process that takes over 24 hours straight to develop. The layer cakes consist of 3 parts which each poses a quite long time to make. Not to mention the cooling process over the fridge overnight. Biscuit Layer Cake, creating the perfect dough from eggs, sugar, flour, a handful of honey as the star. Cream Filling, it takes about 3 hours to boil a tin of sweetened condensed milk and adding cream cheese, sugar, and sour cream to have a creamy caramel filling. Topping, The Medovik Cake is well known for its nutty topping, with crushed walnuts or almond. So, the overall look of this cake has a brownish beige scheme that is just too good to slice. But when you do, there are layers of cake filling that highlight the hard work and patience to make the cake. The original Russian recipes take almost all day long to bake. The waiting baking time is prone to failure. However, there are hacks and tips to sets this cake into perfection. Adding Butter. The original recipe goes back to the old days when Russian would make cakes from simple and affordable material. However, when time change, it is ok to add butter and have that extra moist to the biscuits layers. Burn The honey. Honey as the main ingredient is used both in the batter and frosting. By burning the honey give a caramelized effect. This trick gives more honey flavor and scent at the same time. The burning may cause a little bitter flavor that can easily balance with sour cream. Dulce de leche from the thick caramel from sweetened condensed milk with the honey double the sweetness as a perfect match. The popular Medovik Cake or The Honey Cake Pie consists of layers of custard, cream, and biscuit that can go up as high as 10 tier. The taste is very smooth and sweet with a balance of honey and sour cream. Making this cake takes a lot of patience and also a great amount of focus. Are you interested in making this cake?